PTF funded a first ULS anti-corruption project in 2008. ULS started monitoring the proceedings of the anti-corruption court (ACD) and created a Legal Experts Committee (LEC), with members drawn from various official bodies influencing the legislative anti-corruption agenda. 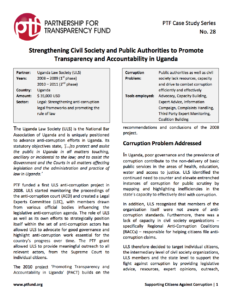 The role of ULS as well as its own efforts to strategically position itself within the set of anti-corruption actors has allowed ULS to advocate for good governance and highlight anti-corruption work essential for the country’s progress over time. The PTF grant allowed ULS to provide meaningful outreach to all relevant actors, from the Supreme Court to individual citizens. The 2010 project ‘Promoting Transparency and Accountability in Uganda’ (PACT) builds on the recommendations and conclusions of the 2008 project.